True wisdom and childlike understanding is a precious gift of God – not the wisdom of this world.. for that is like sounding brass and tinkling cymbals. The wisdom of the world is foolishness to God, but the wisdom of the wise is a tree of life and a flowing river. We read in Ecclesiastes 2:26 that God gives wisdom and knowledge and joy to a man who is good in His sight, and a man’s wisdom makes his face shine – the sternness of his face is changed. We all know the lovely occasion when wisdom was granted to the young king Solomon. Oh but how I love the wisdom that was granted..to another man.. wisdom that was given to the young craftsman, Bezalel. We read about him in Exodus 31 – I have filled him with the Spirit of God, in wisdom, in understanding, in knowledge, and in all manner of workmanship. Bezalel was to design the Tabernacle’s artistic works, in gold, in silver, in bronze… in cutting jewels for setting and in carving wood. 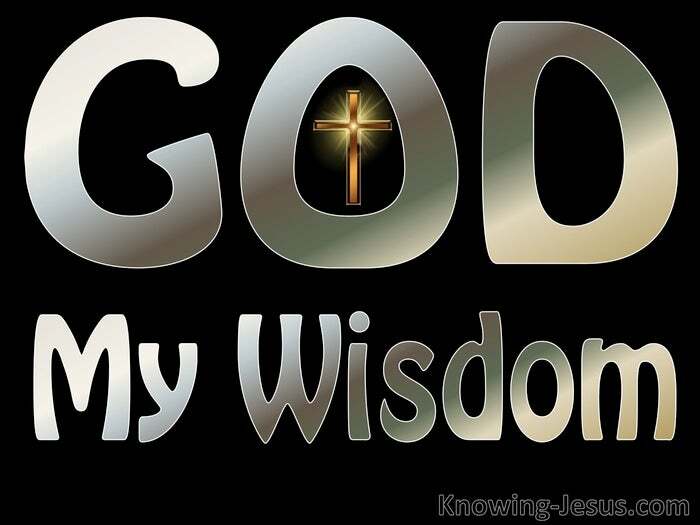 Wisdom does not only come in words from God but in works of God, for all your work carried out in the Spirit of God – is the wisdom of God in you. Godly wisdom and reason is closely allied to humility and child-likeness. 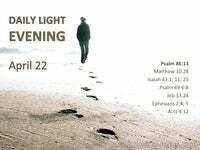 A willingness to learn and a childlike faith and trust in the steadfastness of God. Many humble people are wise and many learned people are foolish.. but the one with wisdom has a God-ward vision and is the one that looks to Jesus. 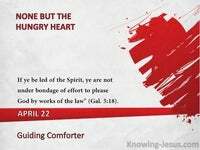 The man with wise understanding relies on God’s Spirit as corrector and guide. But what is the purpose if your desire and prayer for wisdom? Is it to demonstrate what a fine person you are – to be thus endowed from above? 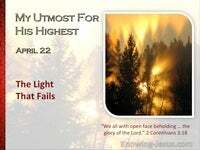 Do you like to flaunt your God-given wisdom before the amazed approval of men? Be careful of your pursuit of wisdom.. it may become your very downfall. 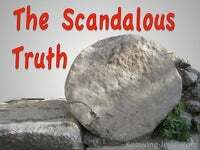 For like Solomon you exchange His leadings for your own carnal desires.. and if you have all wisdom and have not the love of God and love for God – Paul tells us that you are nothing. In answer to Job’s question – Where is wisdom to be found..? And in response to his query – what is the price of wisdom..?” God provides him with the answer in pure simplicity:- Behold…the fear of the Lord, that is wisdom and to depart from evil, that is understanding. I’ve seen more wisdom in a 3-year old child than in many mature men of the world.. a child who has learned that “Jesus is alive” so that there is nothing to fear. Should we not pursue this precious gift that is so freely given to all who ask for it.. for God gives wisdom liberally and ungrudgingly to all who are deficient therein. 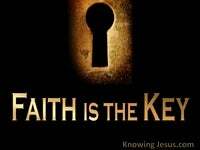 It is not the spirit of ‘know-it-all’ nor that of ‘what a knowledgeable guy / gal I am!’ – but a spirit being renewed – a heart being conformed into the lovely image of Christ. 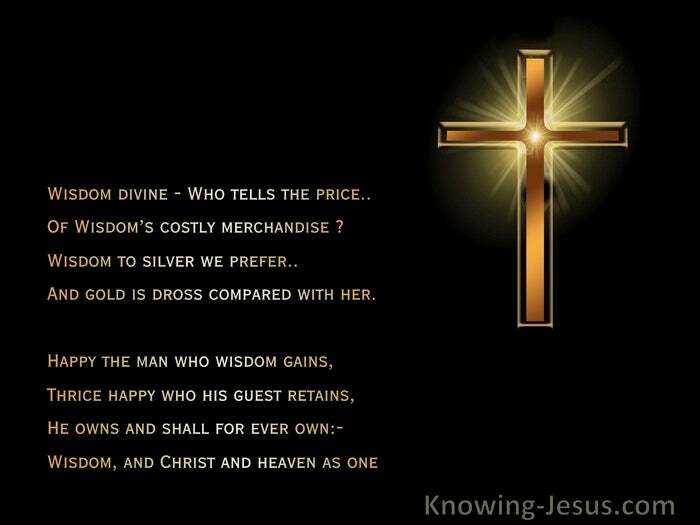 Wisdom divine – Who tells the price..
Of Wisdom’s costly merchandise ? Wisdom to silver we prefer..
And gold is dross compared with her. Wisdom, and Christ and heaven as one.